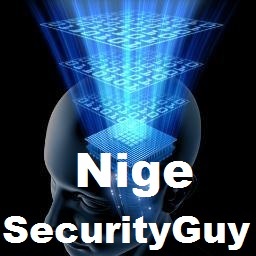 Welcome to Nige the Security Guy Blog: Next-Generation Security Operations. Security done right is a business enabler that dramatically reduces total cost of ownership (TCO) providing a tangible Return on Security Investment (ROSI). IT complexity and fragmentation replaced by an adaptive modular and flexible architecture enables agility and improves your competitive edge — so the business can refocus quickly as new opportunities emerge. Security is a process, not just a product or technology issue. Nigel is a Chief Security Architect with 30 years of international experience in Security Operations, Management, Research, Development and Security Services. He started his career as an assembler programmer who was contracted by the US DoD to develop secure operating systems with multi-level security and preclude covert channels. Nigel is a passionate evangelist who loves working with organizations to share thought leadership and practical strategy to help defend against advanced targeted threats. Very very good articles. Plan to use some of your material, with reference to you and your site. All of us are hopping to re-write the articles related for security managements. Thanks a lot for your sharing and have a good healths.